On Dec.24th , 2:00p.m., the Christmas Eve, the 8th International Custom Celebrationwas held in the auditorium. The audiences, including all of the leaders,directors, league branch secretary，teachers, students ofthe International Department and all the teachers and students from BeijingNo.80 School of Baijiazhuang, got together and celebrated this carnival. Theauditorium was decorated with lanterns and colored banners. The atmosphere ofexhilaration diffused rapidly around the hall, indicating that a brand new yearis coming. 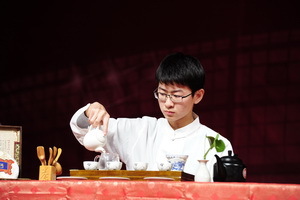 The International Custom Celebration was one ofthe most conventional, the most special, and the most majestic activities amongall those in Beijing No.80 High School International Department. It connectscultures together, shows different custom, and ties China with the world.Despite of the limits of language and civilization, everyone shows uniquenesson the same stage. The Celebration enlarged our horizon, enhanced communicationand helped us to make progresses. All the teachers and students participatedinitiatively and prepared deliberately. They devoted all their efforts toprovide us a brilliant feast of sensations. Stylistic programs and appealingperformances won the applause and appreciation of audiences. At the beginning of thecelebration, four comperes came on stage with glittering appearances. They usedconversations to start the celebration. 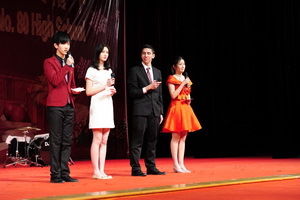 The first performance was poetryrecitation Qiangjinjiu by Nan Junji,Liu Junyi, Wen Tongyu, Wen Enzhao and several students. Their beautiful clothesbrought us to Tang dynasty to see the passion of Li Bai. Sonorous voices andintense emotions expressed the students’ feelings about this poem, cooperationbetween students and virtuoso reciting ability made an excellent performance.It was really great for foreign students to understand ancient poetry in Chinaso insightfully. The next program was a folk pas de deux dance Xingyueshenhua. Silence and movementsmade the dance graceful. Tripping lightly like startled swans, they showed thebeauty of rhythms and elegancy and attracted everyone. Different from theprevious performances, the next song Myselfgave us a sense of melodious delight. It sang for our golden time and told usto value our youth. After a temporary standstill, we embrace a spectacularview----《China KONG FU》by international exchanging class. Our foreign friends changed thecustom they used to be. After several simply makeup, their character changedfrom “big blue eyes with curly hair” to dashing and spirited actors that wore facialmakeupand traditional custom. Although there were several mistakes, theiractions were brilliant enough. Their moved smiling face represented theirpassion to learn about Chinese culture. The performance of elegant teaceremony, paper-cut and calligraphy afterward from different nationalitystudents not only paid our respect of Chinese tradition, but also keep closeties with our foreign friends. Furthermore, students who came fromKorean and Japan’s performance were as splendid as America students. Theyperformed hip-pop. Their gracefully and glaring dance movement with the beatsconfused the ears and eyes of the audiences. Most of the audience swayed to themusic,they bubbling over with enthusiasm, it is our youth! As Chinese students, we display ourcultural tradition in the form of singing songs, reciting poetry and playingopera. There were three songs. It’s is impressing that a student sang along-drawn-out tune song that is a kind of classic of Mongolia named 《Hong Yan》, as he performing, the imageof a wild grassland existing in our mind. Another song named 《Tang Li JianXue》, it is a Chinese ancientcustom song which used a sweet and agreeable tune, and the last song named《someone like you》. 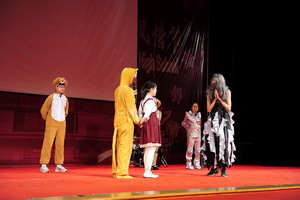 Not only songs performance,Chinese students challenged their selves to perform an English opera named 《the wizard of oz》, a humorous opera withphilosopher theory. The Christmas Celebration was ended by reciting poetry 《I love you, China》, it is well-organized to thetheme of international department. Anyway, we got a successful conclusion.Cheers! Eventually, the 8th International CustomCelebration came to an end. From this celebration, we saw distinctive cultures,improved our abilities, revealed our talents and gained happiness. TheInternational Department is a tolerant, harmonious, creative and open place. 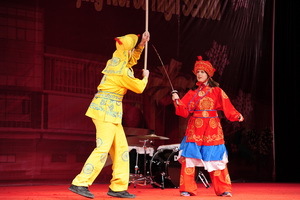 Itshows many students the combination of customs and communicated Chinese cultureand foreign cultures. It reminds us the dreams of China and the civilizationsof other countries forever.